CMS, it's interesting to read what you got from this post. I don't think I was "lauding" the MEN. My low opinion of its overall quality is hardly a secret as I've blogged about it many times before. But that wasn't really the point I was trying to make today. There's no getting away from the fact that the paper's representative of Manchester because, whatever you think of it, it's the only paper we've got. I think we deserve better, so I'm depressed to see them cutting yet again. My reverence, if you can call it that, is for the newspaper in general - not the MEN. As much as I love blogs and websites, my first alleigance is to newsprint. I think for a great many people the MEN is still the embodiment of news in our city, and although the majority might have noticed a gradual decline in standards, I'm not sure they know the true extent to which its local journalism has suffered. Sadly it's the same all over the country. A gentleman from the YEP came to talk to us at work, the definitive hack he'd been with the paper for almost 40 years and was leading the picket line protest against increasing job cuts by Johnston Press. The paper was still going out though, thinner yes, and written in the majority by a special PA team who exist to cover areas affected by industrial action. But how many of the readers would notice this? Or, sadly, care? We have the benefit of being media savvy. There are a lot of people out there who don't know they're reading a succession of regurgitated press releases. They deserve better, but the finances don't lie. JP has debts of ten times its share value. The NUJ described it as 'the HBOS of the newspaper world'. What choice do they have but to make these cuts? Thanks for all your help and support over the years - sure I'll see you soon as well. I'm very much focussed on the future - despite the problems the printed media are experience, it is an exciting time to be a journalist. Just one thing for the sake of accuracy - I have no involvement in CityLife whatsoever. The idea of a Rossendale's local newspaper newsroom being based in central Manchester is clearly laughable. I was wondering how they would work this - a two-hour "surgery" sounds like a bad joke. It's a dire situation but the MEN's decision to run these products into the ground perhaps crates an opening for someone with a bit of vision to create some new independent local news outlets that make money - online or otherwise. I can't believe there isn't an audience for them. Sarah, thanks for pointing that out. I know CityLife wasn't your project, it was just confusing the way I worded the sentence. Have changed it now to avoid misunderstandings. David and Mama B, I agree - the MEN has been mismanaged for years but even if it hadn't, they'd very likely still have had no choice but to make these cuts, if even the much better YP is in such trouble. Hell, even the New York Times is in trouble. It is a dire situation for those of us who love newspapers - I think consumer habits re: the internet/phones and the second great depression between them are going to do them in, at least as we know them. Still, I'm trying to stick with the idea of technology = progress and a better news experience in the long term. Manchizzle, I think your comment that "we're lucky enough to be up close and personal to the death of a newspaper" is quite mean. Yes, the MEN is making job cuts, but many people still work there and depend on its success. If the MEN wasn't there, what would replace it? Sure, hyperlocal may grow in a few years but at the moment there is no-one with money or the vision to come up with a replacement. I doubt Sarah leaving will mean the y no longer have a website or blogs, although it may mean good blogs such as Sarah's foodie blog stop (or appear elsewhere, hopefully). For now, we just have to hope management correct their previous errors for the sake of the paper, its website and the journalists who work there. But yes, you're right - running the Rossendale Free Press out of Manchester city centre is incredibly stupid. Opinionated, I'm amazed that you didn't pick up the irony in that statement, "We're lucky enough..." Really, didn't you read the rest of the post? I was being sarcastic. These are interesting times. Looking at the US experience the newspaper industry rushing to develop a new business model to survive. An online subscription model makes sense, but people generally don't want to pay. In the UK hyperlocal blogging might be part of the future, but I'm not sure they are economically viable in the long term. 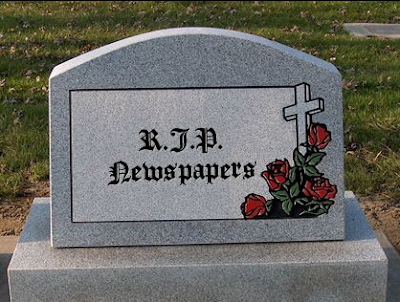 The problem is that independent newspapers are a vital part of our life. I think that if a lot of papers close in the UK, people are going to lose something that is far more valuable than they realise. Hi, quick response to Opinionated - I am indeed continuing with the food blogging. Will be less Manchester-centric but I still hope you will find some scraps to enjoy!See you at http://foodiesarah.wordpress.com. I was on the bus yesterday and i overheard this guy chatting about Manchester Evening News Arena...apparently they've lost the sponsorship and a magazine called Chimp is taking over the name. Chimp arena!!! sounds mad. I wonder if it's true? I've read 4 or 5 blogs which seem to suggest it is. Can anyone shed any light? Oh go on, anonymous, you're just trying to get some free publicity for that mag of yours. I didn't just fall off the turnip truck, you know.